We just took a big trip to North Carolina to install church pews in a few churches. Our first stop was at Wayside Baptist Church in Taylorsville, North Carolina. 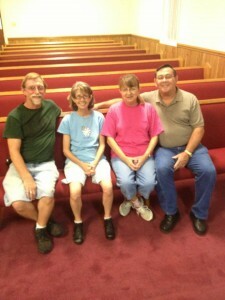 Pastor Kiser and his congregation welcomed us and we quickly got to work installing their church pews. 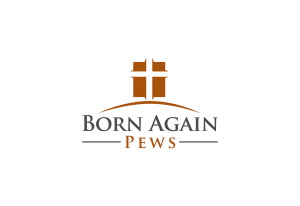 You’ll notice these church pews were made specifically to match the exisiting features of Wayside Baptist, helping to save money on church pews that look great instead of having to remodel everything to match stock church pews. They also help give the space a more open feel. Taylorsville was named when it was first settled in 1847 for Zachary Taylor, who was at the time a general in the Mexican-American War and who later became president. People in Taylorsville don’t think about this much nowadays. 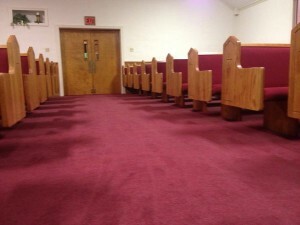 These pews were made with the colors of Wayside Baptist in mind, matching the wainscoting and doors as closely as possible and using red fabric for the church pew seats to match the red carpet. Our church pews, because they’re hand made, can be altered in pretty much any way imaginable to match your church. We also engraved a cross on the church pew ends to give the church a sense of harmony between the pews and the cross in the front of the church at the altar. 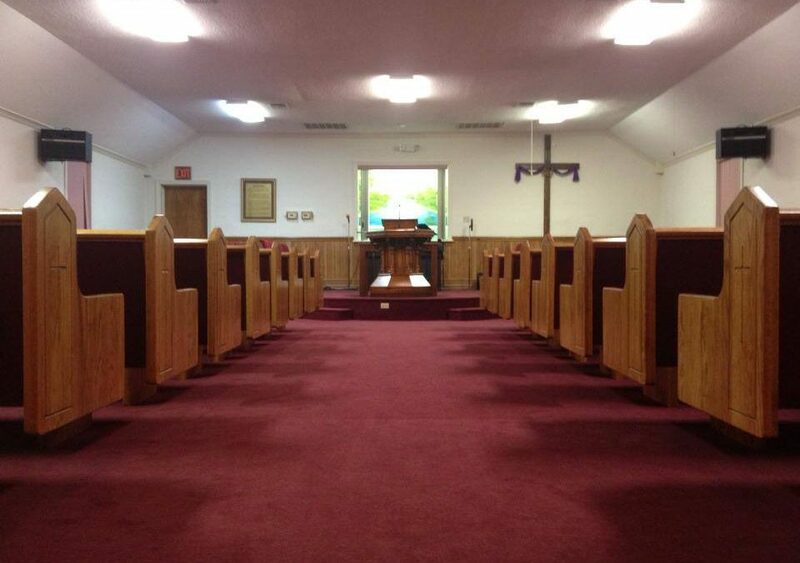 Wayside Baptist chose floating ends for their church pews. This increases the amount of room in the center aisle to allow members of the congregation to enjoy each other’s company, instead of feeling cramped. It also gives the church a lighter feeling. If the church pews had been solid from the floor up instead of a floating style, there would have been a lot more wood tones in the church sanctuary, between the wainscoting, the doors, and other church furniture. Instead, the floating ends balance the wood with the other colors and materials present in the church. If you’re unsure what will work best for your church or aren’t sure what features of your church you need to consider in your planning stage, give us a call and we can give you advice on the best church pews for your sanctuary.